Ranjana Bhandari and her husband, Kaushik De, stand near a Chesapeake Energy gas well in Arlington, Texas, on Sept. 16, 2012. Ranjana Bhandari and her husband knew the natural gas beneath their ranch-style home in Arlington, Texas, could be worth a lot - especially when they got offer after offer from Chesapeake Energy Corp.
Chesapeake wanted to drill there, and the offers could have netted the couple thousands of dollars in a bonus and royalties. But Bhandari says they ultimately declined the deals because they oppose fracking in residential areas. Fracking, slang for hydraulic fracturing, is a controversial method used to extract gas and oil. Their repeated refusals didn't stop Chesapeake, the second-largest natural gas producer in the United States. This June, after petitioning a Texas state agency for an exception to a 93-year-old statute, the company effectively secured the ability to drain the gas from beneath the Bhandari property anyway -- without having to pay the couple a penny. In fact, since January 2005, the Texas agency has rejected just five of Chesapeake's 1,628 requests for such exceptions, a Reuters review of agency data shows. Chesapeake has sought the most exceptions during that time -- almost twice the number sought by a subsidiary of giant rival Exxon Mobil, Reuters found. Chesapeake says it only seeks exceptions to the Texas statute -- called Rule 37 -- as a last-ditch effort, and often because it cannot locate the land owner. The law, company spokesman Michael Kehs said, "protects the rights of the majority of mineral owners." Not so, say many local residents. "The principle of it is insane," said Calvin Tillman, a former mayor of Dish, Texas, a small town north of Fort Worth where drilling has been heavy. "Not only can they take your property, but they don't have to pay you for it." Chesapeake's use of the Texas law is among the latest examples of how the company executes what it calls a "land grab" -- an aggressive leasing strategy intended to lock up prospective drilling sites and lock out competitors. Chesapeake has become the principal player in the largest land boom in America since the California Gold Rush of the late 1840s and ‘50s, amassing drilling rights on more land than almost any U.S. energy company. After years of leasing tracts from New York to Wyoming, the company now controls the right to drill for oil and gas on about 15 million acres -- roughly the size of West Virginia. More than its rivals, Chesapeake has made land-leasing central to its business model. An analysis by investment research firm Morningstar Inc. shows that the company has spent $31.2 billion to acquire drilling rights on unproven U.S. land in the last 15 years. Exxon -- a company whose revenue was 35 times larger than Chesapeake's last year -- spent $27 billion during the same period. Chesapeake's rationale is clearly spelled out in company filings with the U.S. Securities and Exchange Commission. "We believed that the winner of these land grabs would enjoy competitive advantages for decades to come as other companies would be locked out of the best new unconventional resource plays in the U.S.," the company wrote in its 2012 filing. It has been less forthcoming about the tactics used in implementing that strategy, however. Reuters reviewed hundreds of internal Chesapeake emails and thousands of pages of documents, including in-house data that show how Chesapeake evaluates its land acquisitions. Reporters also examined dozens of lawsuits by land owners in seven states, and interviewed contractors proffering deals for the company. What emerged were approaches to leasing property that land brokers, land owners and lawyers say push ethical and legal limits. Chesapeake has unilaterally altered or backed out of leases. And in Texas and at least three other states, it has exploited little-known laws to force owners to hand over drilling rights and sometimes forfeit profits. Some of the company's own contractors have considered the tactics dubious. "In my entire career, I have never been put in the position that (Chesapeake) has recently handed us," contractor David McGuire wrote to Chesapeake CEO Aubrey McClendon on Aug. 10, 2010. He had just been ordered by the company to reject hundreds of signed leases in Michigan -- through means that McGuire said were "beyond anything I could ever have imagined." He told McClendon that he regretted ever being part of Chesapeake's land grab. "I simply wish our deal would never have taken place," he wrote in the email. Some of the methods that Chesapeake has used aren't unique to the company. Nor is the outcome necessarily one-sided. Many land owners have gotten rich on deals with Chesapeake. "Chesapeake has been successful in our leasing because we strive to fairly compensate the more than one million Chesapeake mineral owners," said spokesman Kehs. "Chesapeake has paid nearly $12 billion in lease bonus payments and nearly $10 billion in royalty payments since 2005." How Chesapeake went about its land grab has become increasingly important in the past year, as the company weathers a governance crisis and liquidity crunch. In April, Reuters reported that McClendon, 53, had arranged more than $1.5 billion in financing by pledging his share of the company's wells as collateral for personal loans. Most of the borrowing came from a firm that also is an investor in Chesapeake, a potential conflict of interest. The report prompted Chesapeake's board of directors to strip McClendon of his chairmanship and hire an independent chairman. Disgruntled shareholders replaced four of its nine directors. In June, Reuters documented Chesapeake's efforts to team with Canadian rival Encana Corp. to avoid driving up land prices in Michigan. The U.S. Justice Department is investigating whether the companies violated antitrust laws. Now, as Chesapeake fights to regain its footing, it is looking to execute the last stage in its land strategy: filling out its vast holdings, and then developing or selling them. Where Chesapeake doesn't intend to drill, it intends to sell, according to company presentations. Much hinges on this next chapter. This year, the company aims to sell $14 billion worth of assets to close a cash-flow deficit. The real estate strategy has been honed by McClendon, who started his career as a land man, the term for brokers who acquire mineral rights for energy companies. On April 28, 2010 -- amid one of the biggest land grabs in Michigan history -- McClendon received a flattering email that harkened to his beginnings. It came from contractor McGuire, manager at O.I.L. Niagaran, a local firm that Chesapeake hired to help handle its leasing efforts in northern Michigan. "To the most successful Landman in the world," McGuire's email began. McClendon adored the compliment. "That is the nicest title anyone has ever given me," he replied. "I really appreciate that, thanks David!" McGuire had been hired to serve as Chesapeake's principal outside land man in Michigan, where the company sought acreage in the Collingwood shale formation, then one of the most promising new oil and gas plays in the United States. After Chesapeake identifies acreage that might hold significant gas or oil, it deploys armies of land men -- some Chesapeake employees, others contractors such as McGuire and his employees. They knock on the doors of land owners to solicit leases. Few regulations govern what they can say or what language can be included in leases. Chesapeake has, until recently, employed more than 4,000 land men. Often, they are ordered not to disclose that Chesapeake is their client, according to internal emails and interviews with land owners and land men. "It is critical that we do everything in our power to keep our client's name secret!!!!" wrote Joe McFerron in a Nov. 10, 2010, email to his staff. McFerron was a contractor with RedSky Land, an Oklahoma brokerage hired by Chesapeake in North Dakota and Michigan. McFerron did not respond to requests for comment. Broker McGuire pursued his task energetically and in secret: Within three months, O.I.L. Niagaran and other subcontractors for Chesapeake had leased about 450,000 acres in Michigan. Chesapeake spent some $400 million there through McGuire and other brokers. But internal Chesapeake emails show that by August -- a few months after he had called McClendon the world's best land man -- McGuire was troubled by the experience. At the direction of McClendon and other Chesapeake executives, McGuire was ordered to reject or put on hold hundreds of leases after a Chesapeake test well performed poorly and a major Chesapeake competitor stopped new leasing. A backlash ensued, and McGuire's company bore the brunt. O.I.L. Niagaran became a defendant in about 150 breach-of-contract lawsuits filed since late 2010 in Michigan state courts. McGuire referred questions to an attorney, who declined to comment. Extricating itself from land leases has sometimes proved as important to Chesapeake as obtaining them. In lawsuits in Texas, Pennsylvania and North Dakota, land owners allege Chesapeake has treated signed leases as mere placeholders for deals that it may later choose not to honor. Two state court judges in Michigan ruled early this year that Chesapeake had the right to reject leases at any time before title to the minerals was finalized. But in the last three months, judges in Louisiana and Texas have awarded nearly $120 million to two land owners -- Peak Energy and Preston Exploration -- after finding Chesapeake breached contracts by walking away from signed deals. Scores of similar cases in Michigan and Texas have been settled this year. In late 2008, as the financial crisis sent natural gas prices tumbling, Chesapeake began to reevaluate deals it had cut. One group of land owners caught in these retreats was the Witt family. They own a 33-acre tract above the Haynesville formation of rich gas fields in Harrison County, Texas. In August 2008, the Witts were approached by land men working for Chesapeake. The offer: to lease mineral rights for the Witts' land for $14,000 per acre, according to an amended complaint filed in May 2012. Instead of checks, Chesapeake issued bank drafts, which can be cashed after an owner's property title is reviewed -- typically 30 to 90 days after a lease is signed. When the Witts went to cash the Chesapeake bank draft, they were told by bank officials that the payment would not be honored. A hand-written note on one of the Witts' bank drafts rescinded by Chesapeake reads, "Cancelled for renegotiating price (per) acre," according to an exhibit submitted in the family's lawsuit. The Witts alleged that McClendon told Chesapeake employees "to reduce the already agreed upon bonuses down to no more than $5,000 per acre" and to "take lawsuits" if necessary. The family claimed they were "cold-drafted," a term used to describe an "unethical practice in the leasing industry" in which the land owner is provided a bank draft "in consideration for a valid, enforceable lease," even though the company's intent is "not to honor the payment obligation." The practice allegedly enables Chesapeake to lock up property, block rivals, prevent owners from shopping for better offers, and then later decide if it wants to keep the acreage. "It is unethical by anyone's standards in the energy industry if the intention was not to pay the draft at the time it was issued," said Richard Bate, an oil and gas attorney in Denver. "It is the essence of the land grab because it boxes out the competition without the intention to pay." In response to the suit, Chesapeake said it "was simply under no contractual obligation to pay lease bonuses" to the Witts, according to court records. The company said the leases were "not signed by Chesapeake," though copies show they were taken in the name of a Chesapeake subsidiary, Chesapeake Exploration. Terry Rhoads, an attorney for the Witt family, said their lawsuit was settled on Aug. 17. Terms were t disclosed. Some landowners oppose fracking, and New York, Vermont and Maryland have all refused to grant fracking licenses. The technique's effects on groundwater are still under review by the U.S. Environmental Protection Agency. But Chesapeake and other energy companies, which view fracking as safe, are now using state statutes to access the minerals under unleased land even if owners object to the drilling technique. If property owners refuse deals, Chesapeake and its land men have made clear their plans to take the oil and gas from beneath the land by using little-known laws in Texas, Ohio and other states. The terminology varies from state to state -- a Rule 37 exception in Texas, mandatory pooling or unitization in Ohio. But the result is often the same: getting state regulators to enable the company to drill, sometimes against the owner's will. The economic argument for granting access to unleased land is logical. Difficulty in stitching together large plots leaves holes in drilling units that can make development less profitable. Large, contiguous plots enable drillers to pump more oil and gas. Allowing companies to access remaining land means that property owners who want to sell their mineral rights aren't shortchanged by a few holdouts. "Under Ohio law, it's not legal for one or a few landowners to keep the vast majority of landowners from exercising their rights to develop their minerals and get the benefits," said Heidi Hetzel Evans, a spokeswoman with the state's Department of Natural Resources, which rules on such requests. Chesapeake has based some of its petitions on just such a premise: that it is protecting the rights of people who want to drill, rather than succumbing to the will of holdout landowners. That marks a turnabout in Texas. When the state passed the Rule 37 statute in 1919, it was meant to prevent excessive drilling of oil wells and to protect the mineral rights of small landowners, say legal experts. The rule prohibits companies from drilling too close to unleased properties. Today, Rule 37 exceptions "seem to be a new creative use of the statute in a way that was not intended when it was designed," said Matthew Festa, an associate professor of law at South Texas College of Law. "It's possible that this amounts to the transfer of private property from one private entity to another private entity." Since Jan. 1, 2005, three of the largest oil and gas drillers in Texas have applied for 3,595 exceptions to Rule 37, according to a Reuters review of Texas Railroad Commission data. Chesapeake has been the most active. It has applied for 1,628 exceptions, compared with 1,073 for rival EOG Resources and 894 for XTO Energy, a unit of Exxon Mobil. Chesapeake and its rivals almost always win. Energy companies only have to notify land owners that they intend to apply for a Rule 37 exception. If the owner doesn't protest, commission guidelines require the petition be granted. Texas Railroad Commission spokeswoman Ramona Nye said the agency believes there is no evidence that fracking is unsafe. And evaluating the fairness of Rule 37 exceptions is not part of the commission's mandate, she said. "We are charged by the Legislature to make sure hydrocarbons don't stay underground and go to waste," she said. "It becomes a balancing act. Do we allow two or three landowners to prevent a majority from developing those minerals?" Energy companies and their executives are the dominant contributors to the election campaigns of railroad commission members and candidates, according to a Reuters review of Texas Ethics Commission data. For example, Chesapeake was among the largest donors last year to the campaign of the commission's chairman, Barry Smitherman, who is seeking reelection this year. The company contributed $25,000. 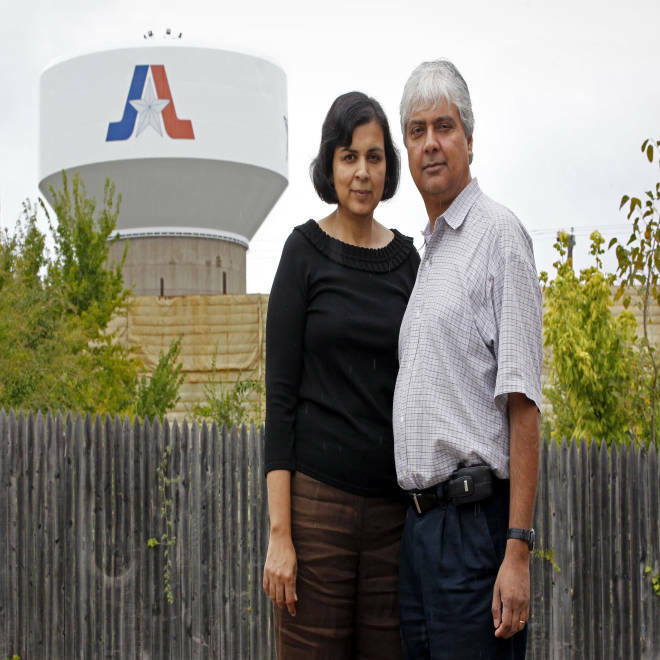 In Texas, Arlington resident Bhandari is resigned to losing future income from the gas beneath the couple's land. "We decided not to sign because we didn't think it was safe," Bhandari said. But "the railroad commission doesn't seem to care about whose property is taken." They aren't the only owners facing a similar scenario. Ohio's Utica shale formation is a cornerstone of Chesapeake's plan to drill for more oil, which is fetching a premium at a time of rock-bottom natural gas prices. The company has already leased more than 1 million acres of land in the state. It wants more. One result: Dozens of Ohio land owners interviewed by Reuters say Chesapeake land men are raising the prospect that their land will be "force pooled" -- a term for using state law to mandate that unleased property be included in drilling units. That contention is supported by a tape recording of land man Nate Laps, who worked for Chesapeake in Ohio through subcontractor Kenyon Energy. The recording was made by David Kennedy, a landowner in Stark County, Ohio. Kennedy later signed a lease with Chesapeake, receiving a bonus of $9,900 for his 11-acre property. He said he feels that Laps gave him a "fair shake." The recording indicates that not all landowners are as fortunate. In a portion of the recorded conversation, Kennedy asked Chesapeake land man Laps: "Mandatory pooling -- what is that?" Laps responded: "We don't like to talk about this because we won't want to come across as it's our way or no way. … But since you mentioned it -- if properties don't want to sign, if we have 90 percent secured of the well that we need, we have the power to put these people in the lease without their permission." Kennedy: "Do you still have to pay 'em?" Laps: "All you do is pay them the royalties. … We can do whatever we want." Laps did not respond to emails and phone calls seeking comment. But state records in Ohio show Chesapeake is doing precisely what Laps said, and with the blessing of regulators. Unlike Rule 37 in Texas, Ohio statutes allow that landowners could receive royalties. Hetzel Evans said the DNR receives "a few dozen or more" forced-pooling applications per year. The DNR has approved most of them, she said, but only when a driller shows "there's no other option." Asked about the comments by Laps to landowner Kennedy, she said: "It does concern us if we're being portrayed as allowing an operator to just come in and do what they will. A comment like that makes it sound like we don't have a framework in place." State Rep. Mark Okey, a Democrat who represents nearby communities, has unsuccessfully sponsored legislation to govern the conduct of land men. He said his constituents have singled out Chesapeake's brokers as the most forceful. Their land men have even sought to lease his property, he said. "They believe in intimidation tactics. They threaten you. They will yell at you. … It's all about getting you to sign," Okey said. "You don't sign? We'll go around you. You don't sign? You'll not get anything out of your mineral rights. You don't sign? Then you're going to pay the price because we're going to take those minerals from you." David and Catherine Conrad live just outside the town of Hartville, Ohio, near Akron. They said they refused to sign a lease with Chesapeake last year because they, too, oppose fracking. But a Chesapeake well will soon snake beneath the Conrad home. Chesapeake requested in November that the couple's land -- and the land of 48 other property owners -- be included in an area where Chesapeake plans to drill six wells. Chesapeake's application was reported by the Columbus Dispatch. On July 10, officials with the DNR approved Chesapeake's request. "I don't think the state should be able to take a landowner's rights to generate a profit for a private company," Conrad said. In its petition, Chesapeake told regulators its proposed drilling unit could produce 4.5 million barrels of oil and 3.5 billion cubic feet of natural gas -- if the plots of the 49 landowners who didn't lease their property to Chesapeake were included.